Leave Nairobi 680 Hotel after breakfast for Maasai Mara. Stop over at great Rift Valley escarpment for photos before proceeding to Narok town for lunch. Continue drive to the ideal campsite near Sekenani gate for 4 o’clock tea. Evening game drive, Dinner and overnight at the campsite. 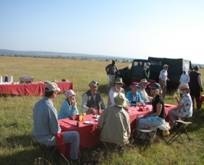 Start early for full day game drive inside Maasai Mara. Lunch en route to hippo point followed by afternoon drive until afternoon tea at the campsite. Fantastic evening game drive with chances to spot the big five and 500 other small animals plus varieties of birds. Dinner and over night at the camp site. Early morning game drive before breakfast. Breakfast around 10am. Drive to Narok for lunch proceed further to Nakuru Kunste Hotel for dinner and overnight. Breakfast early and for lake Nakuru National Park for a mid-day game drive. Common sightings are fantastic wonderful flamingoes, white rhinos, buffaloes, giraffes, warthogs, and over 100 different species of birds (one of the most well-known birds sanctuaries in Kenya). Lunch at the hotel. Drive to Samburu national park via Nanyuki. Dinner and overnight at the campsite at Samburu national park. DAY 5: Full-day game drive inside Samburu National Park with wonderful views of animals. Lunch at the campsite. Dinner and over night against at Samburu. Binoculars and cameras a must! DAY 6: Farewell game drive before lunch. Head for Nairobi via Nanyuki and back to 680 Hotel.